We’d love your help. 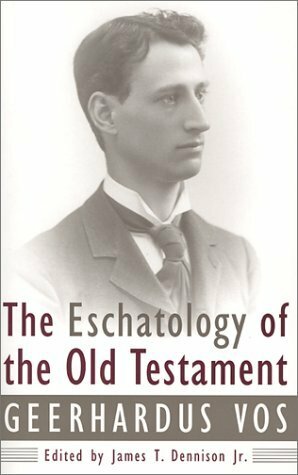 Let us know what’s wrong with this preview of The Eschatology of the Old Testament by Geerhardus Vos. This previously unpublished material has been compiled from several manuscripts relating to Geerhardus Vos's course lectures on Old Testament Eschatology. The editor has weaved together these sources to provide the most complete text possible of Vos's materials on the subject. To ask other readers questions about The Eschatology of the Old Testament, please sign up. Scholarly and thought provoking. This is an edited compilation of Vos' notes on the subject. I suggest reading Vos' "Biblical Theology" before reading this. This is not a book discussing the 70 weeks in Daniel 9 or other end times passages, rather the first section deals with hermeneutics, providing some useful discussion of both the OT use of the OT, and NT use of the OT, the remainder of the book examines messianic prophecies, tracing their development such as the Shiloh prophecy of Genesis 49:10. A good combination of hermeneutics and messianic theology via biblical theology in the OT. A book that I wouldn't recommend to anyone but would love to recommend to everyone! Since it was based off of lectures it can be a bit thick to read, but within the words are some really good reflections. I especially like what he mentioned about individual and corporate distinctions in the Old Testament prophecy schema. But due to its thick reading, sometimes incomplete thoughts and presupposed knowledge it makes the book a bit inaccessible at times. Perhaps because this book was a collection of notes for a study on OT eschatology that Vos gave, that it is often a difficult read. There is a lot of interaction with the "critical school", which was just too much for me. There were a lot of helpful things, but overaly, the book is not an easy read. Geerhardus Johannes Vos was an American Calvinist theologian and one of the most distinguished representatives of the Princeton Theology. He is sometimes called the father of Reformed Biblical Theology. Vos was born to a Dutch Reformed pastor in Heerenveen in Friesland in the Netherlands. In 1881, when Geerhardus was 19 years old, his father accepted a call to be the pastor of the Christian Reforme Geerhardus Johannes Vos was an American Calvinist theologian and one of the most distinguished representatives of the Princeton Theology. He is sometimes called the father of Reformed Biblical Theology. Vos was born to a Dutch Reformed pastor in Heerenveen in Friesland in the Netherlands. In 1881, when Geerhardus was 19 years old, his father accepted a call to be the pastor of the Christian Reformed Church congregation in Grand Rapids, Michigan. Geerhardus Vos began his education at the Christian Reformed Church's Calvin Theological Seminary in Grand Rapids, before moving to Princeton Theological Seminary. He completed his studies in Germany, receiving his doctorate in Arabic Studies from the Philosophy Faculty of Strassburg University in 1888. Herman Bavinck and Abraham Kuyper tried to convince Vos to become professor of Old Testament Theology at the Free University in Amsterdam, but Vos chose to return to America. Thus, in the Fall of 1888, Vos took up a position on the Calvin Theological Seminary faculty. In 1892, Vos moved and joined the faculty of the Princeton Theological Seminary, where he became its first Professor of Biblical Theology. In 1894 he was ordained as a minister in the Presbyterian Church in the USA. At Princeton, he taught alongside J. Gresham Machen and Benjamin Breckinridge Warfield and authored his most famous works, including: Pauline Eschatology (1930) and Biblical Theology: Old and New Testaments (1948). Despite his opposition to the growing modernist influence at Princeton in the late 1920s, he decided to remain at Princeton Seminary after the formation of Westminster Theological Seminary by Machen, as he was close to retirement. Vos did indeed retire to California in 1932, three years after the formation of Westminster.